Should I pay for carbonated water? I often eat at places that have self-serve soda machines. As you surely know, you pay up-front for a drink such as Coca-Cola or Sprite. After that, you are entitled to get as many refills of your favorite artificially flavored drink as you want. You can even drink one glass of one flavor and then switch, or create your own mix! If instead you choose to be healthy and not fill your body with chemicals, sugar (or a chemically-engineered substitute), and other bone destroying agents, you tell the cashier that you just want water. You get a cup (often different) and you are entitled to get water from the same machine, but not flavored soda – but you don’t pay for it. Here’s the dilemma and I want to settle this once and for all: A lot of these machines offer “soda”, which is water but carbonated. If you don’t pay for your drink, only for “just water”, are you entitled to drinking “soda”? Or just the non-carbonated version commonly known as water? Most of the costs involved in providing these drinks are fixed regardless of what you get: electricity for the machine, the cost of the cup if disposable or the cost of washing it, the cost of the ice-making process, the nominal cost of the actual water. Sprite, Coke, and friends get their own dedicated dispensing terminal with colorful and attractive photos, but water is relegated to a little white lever, almost as an afterthought. 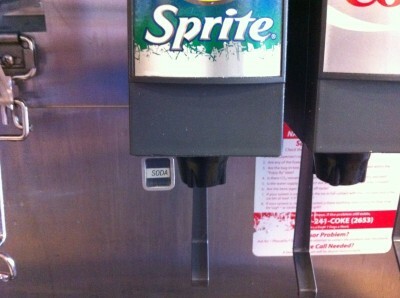 Soda, like water, is also relegated to a little white lever (see image). The carbonation process amounts to dissolving air in water. We normally do not pay for air. Should I pay for unflavored soda? No way: Water is complimentary, and air is free. Absolutely: Soda is half a milliliter of chemicals away from Coke. You need to take this up with the Supreme Court. Please vote, and if you have any additional insight, feel free to leave a comment. 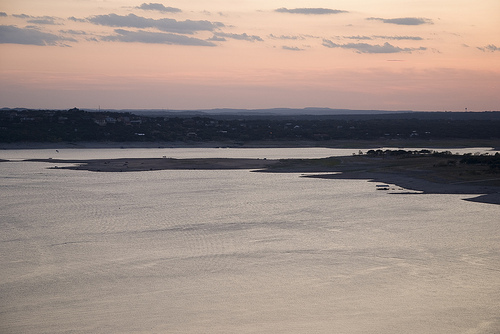 I was in Lake Travis last week. The lake is emptier that I’ve ever seen it before. And the low water level means little water flow, which translates directly to a dirtier than usual lake. We need some rain badly. More pictures including girls in bikinis upon request.